Join us for our annual Oyster Roast! 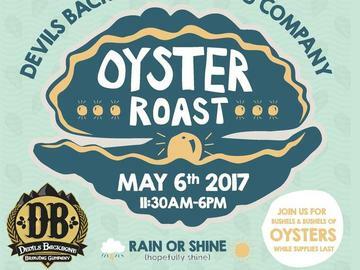 We will be serving up bushels & bushels of fresh oysters to enjoy alongside Lemongrass Wit, our official Oyster Roast brew. Live Music by Full Moon Saloon and Scott Slay and the Rail. The event will be held rain or shine (hopefully shine!) in our outdoor Meadows. Your pre-purchased ticket includes 15 oysters per bucket & an official Devils Backbone Oyster Roast t-shirt. You will also be automatically entered into a drawing for a chance to win two life-time Devils Backbone Mug Club Memberships and a brew day with our Basecamp brewers (the brew day includes lunch and a private tasting during the day). Tickets are $27 online, will be available for $35 day of event.